A delta wave is a type of high amplitude brain wave found in humans. Delta waves have a frequency from one to four hertz and are measured using an electroencephalogram (EEG). These brain waves are thought to emerge from the thalamus and are generally associated with slow-wave sleep (during stages three and four of the stages of sleep.) This period of time during which delta waves occur is often known as deep sleep. 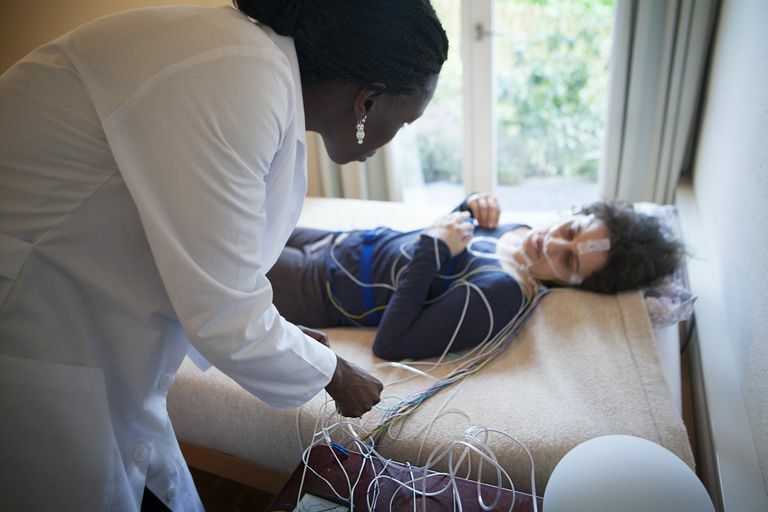 Delta waves were first identified and described in the early 1900s after the invention of the electroencephalogram allowed researchers to look at brain activity during sleep. During sleep, the brain cycles through a number of different stages differentiated from each other by the brain activity that occurs during each stage. During the initial stages of sleep, people are still awake and somewhat alert. At this point, the quick and small beta waves are produced. Eventually, the brain begins to slow down and slower waves known as alpha waves can be observed with an EEG. Once asleep, stage 1 officially begins. At this point, the brain creates slow, high amplitude activity known as theta waves. This stage is usually very brief, lasting around 10 minutes or so. Stage 2 lasts slightly longer, around 20 minutes, and is marked by rapid bursts of rhythmic brain activity known as sleep spindles. Once a person enters stage 3 sleep, the brain begins to produce the slow and deep waves of delta sleep. People are far less responsive and less aware of the external environment at this point. Delta wave sleep is often thought of a transitional point between light and deep sleep. Previously, researchers distinguished between stage 3 and stage 4 of sleep. During stage 3, less than half of brain waves consist of delta waves, while more than half of brain activity consists of delta waves during the fourth stage. However, these two stages were recently combined into a single stage. It is in the next stage that REM sleep begins. This stage is characterized by rapid eye movements and increases in dreaming. Interestingly, research has found that women display more delta wave activity than men. Females among most other mammalian species display a similar tendency, although researchers have not yet agreed on a specific reason why. Ketogenic diets, which are very high in fat and low in carbohydrate, can cause delta wave increases. Brain disorders can also have an effect on the display of delta waves. Parkinson's disease, schizophrenia, and narcolepsy are all characterized by changes in delta wave activity. Some drugs and chemicals have been shown to impact the brain's delta waves. Alcohol can also have an effect on delta waves and long-term abuse can lead to lasting changes in delta activity. Afaghi, A., O'Connor, H., & Chow, C. Acute Effects of the Very Low Carbohydrate Diet on Sleep Indices. Nutritional Neuroscience. 2008;11(4): 146-154. Colrain, I. M., Turlington, S., and Baker, F.C. Impact of Alcoholism on Sleep Architecture and EEG Power Spectra in Men and Women. Sleep.2009;32(10):1341-352. Sekimoto, M., et al. Cortical Regional Differences of Delta Waves During All-Night Sleep in Schizophrenia.​ Schizophrenia Research; 2010. doi: 10.1016/j.schres.2010.11.003.